I’ve spoken and worked with women who created their ideal birth experience, because they first had a delivery process that didn’t work for them in some ways. Maybe they agreed to an episiotomy (or other intervention) that in hindsight they wish they hadn’t authorized. Maybe they felt they invited too many people to be part of the birth. Maybe they didn’t enjoy the hospital or birth center they selected. In all cases, they learned from their first experiences and then intentionally and powerfully created what was more truly aligned with their values and desires. And, then when they tell me about the birth experience they envisioned, orchestrated, and generated by being thoughtful and by advocating for themselves; they are animated and giddy! You can hear the pride and empowerment in their voices. I love this. I love that these women created their own reasons to be giddy. And… recently I’ve been thinking about this more. These women are giddy because they knew all-too-well that the experience could have unfolded in a less-than-ideal way, as it already had for them. They knew it took something to alter their experiences. They got to work and they made it happen. And they got to giddy. Can we get to this kind of giddy without taking the detour to a less-than-desirable place first? There is something to truly understanding the magnitude of what we’ve generated, if we’ve first experienced some set backs. If there wasn’t some struggle in our journeys to achieve some of the things we most want to achieve, then those achievements wouldn’t be quite so sweet. And, at the same time, I like to believe that things could fall together easily for us and we could just feel giddy about that. What do you feel giddy about? 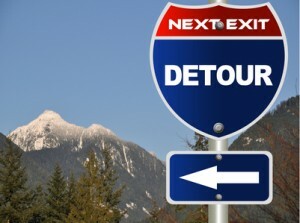 Was there a detour to a less-than-desirable place before you got here?